PHOENIX (CNS) — The Refuge is an aptly named establishment in Phoenix’s Melrose District. For customers who frequent or occasionally visit the cafe, it’s a place to rest and recharge. That goes for customers who stop by for a morning coffee, meet a friend for lunch or hang out at night when The Refuge becomes a wine bar. For artists, it serves as part gallery — with paintings and other work on the wall — and part store that offers hope of a small income. A cooperative with Lutheran Social Services empowers individuals who have come to the U.S. as refugees to showcase and sell handcrafted jewelry, purses and other gift items. For a select number of young adult refugees and a growing number of veterans, The Refuge has served as a solid steppingstone to meaningful employment. Its third crop of interns is brewing now, thanks to Catholic Charities staff who invests in them. They’re learning the skills and gaining the confidence and work history they need to move toward self-sufficiency. The Refuge is a social enterprise of Catholic Charities Community Services in the Phoenix Diocese. All of its proceeds support the programs that strengthen its outreach, particularly the refugee, unaccompanied minors and veterans programs. John Strawn, general manager of The Refuge almost since its inception three years ago, called the advent of the veteran training program a perfect storm. He had already completed a 10-week trial run training young adult refugees and youth who aged out of the foster care system and sorely needed workplace skills and soft work skills to support themselves. “The greatest message we tried to convey is: You control your future. It’s OK to stumble. It’s OK to make mistakes,” Strawn said, but it’s important to learn from them and move on. Shortly thereafter, Catholic Charities acquired the MANA House. The facility offers transitional housing for Marine, Army, Navy and Air Force veterans and Catholic Charities received a grant to pay part-time minimum wage for those interested in re-entering the work force. The Refuge expects to train 16 veterans this year. Some haven’t held a job in almost a decade. Following 12 weeks of budgeting, baking, tracking inventory, cleaning and serving as a barista, the veterans left transformed. One is now an assistant manager at a nearby restaurant and will be a peer mentor for a chemical abuse program at the Veterans Affairs hospital. Another now works for a catering company. Oscar Martinez went on to culinary school. Martinez, 56, began his third career at The Refuge. The Army veteran and former diesel mechanic turned telecommunication technician spent seven months in and out of hospitals before coming to MANA House and The Refuge. Not all of them stick to the food industry. One graduate is working at MANA House. Another is drawing upon his information technology background to pursue a career at Cisco Systems and a third wants to open a bike shop. “They all have different desires and needs and we try to cater to them as individuals,” Strawn told The Catholic Sun, newspaper of the Phoenix Diocese. For Saleto Henderson, an Army and Navy veteran, continuing to work at The Refuge allows him to be part of a positive community. He hasn’t always had that in life. 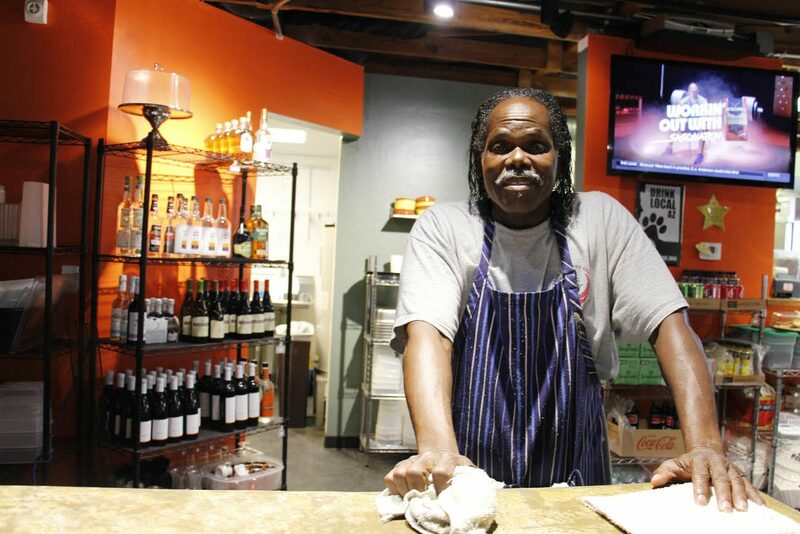 Strawn has seen Henderson take ownership of everything he does — even to the point of checking on how the clean dishes are arranged on his day off. The customers adore him. “He’s such a joy to be around. He’s gotten a second chance on life,” Strawn said. Whether they’re a veteran or a refugee, Strawn said building their self-esteem and ability to see that The Refuge is a group effort on everything are the bigger hurdles — obstacles that get smaller with time. Hammel is a staff writer at The Catholic Sun, newspaper of the Diocese of Phoenix.